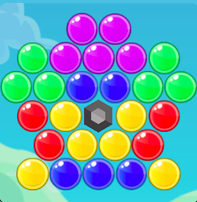 In Bubble Shooter 2 you are trying to shoot a small bubble at a huge cluster of them and has the goal of clearing the screen of all bubbles. This part changes with a spin. The cluster of bubbles rotates around itself when the force of your shoot hits it. This way the color you were hoping to hit on your next shoot, might have moved around! Enjoy Bubble Shooter 2!